The order is not only morally reprehensible and legally problematic; it is also strategically irresponsible and will create real security risks for the United States. 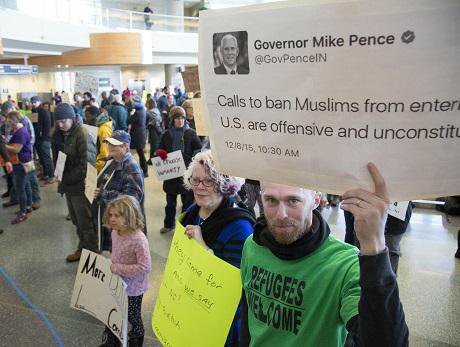 Andrew Lynes of Boise, Idaho joins a group of more than 600 people protesting President Donald Trump's refugee policy on January 29, 2017 at the Boise Airport. Idaho Statesman/TNS/ABACA ABACA/PA Images. All rights reserved.Trump’s executive order banning nationals from seven Muslim-majority countries (including war-torn Syria) and temporarily halting the admission of all refugees is first and foremost an affront to humanitarianism, rightly characterised by Dylan Matthews as a ‘triumph of cruelty’ towards those fleeing war and persecution. From the thousands of individuals whose lives are being affected by the order, to the collective sense of ‘this isn’t who we are,’ the order undercuts the core values that the United States purports to stand for as it dismisses any sense of compassion. As we have seen in the US and elsewhere in the past, ethics are often outweighed by other considerations in the formulation of policy. However, the new order is not only immoral, it is also illegal, under both US domestic law and US obligations to the 1951 Convention on Refugees, the Convention Against Torture (CAT), and the Universal Declaration of Human Rights (UDHR). Judicial rulings in Brooklyn, Boston, and Virginia were quick to block the enforcement of the order, but so far only in temporary, limited ways. Still, the legal arguments against the order can give more traction to purely moral protestations. In reality, the actual security threat will come from Trump’s executive order. As Senator John McCain and others have pointed out, the order only feeds ISIS propaganda and supports claims that the United States is fighting Islam rather than fighting terrorism. Yet even more immediately, the order will compromise US counterterrorism efforts in Iraq, Syria, and Libya where US military, intelligence, diplomacy, and development agencies rely heavily on local partnerships. These partnerships, in which local individuals who serve as translators, fixers, and colleagues do so with great risk to themselves and their families, will be severely compromised if the US cannot offer any protection in the form of visas. In sum, the order is morally, legally, and strategically wrong. Challenging it effectively will require not only public protest and dedicated legal teams, but also those in the military and security sectors to speak up to counter Trump’s false claims and politics of fear.